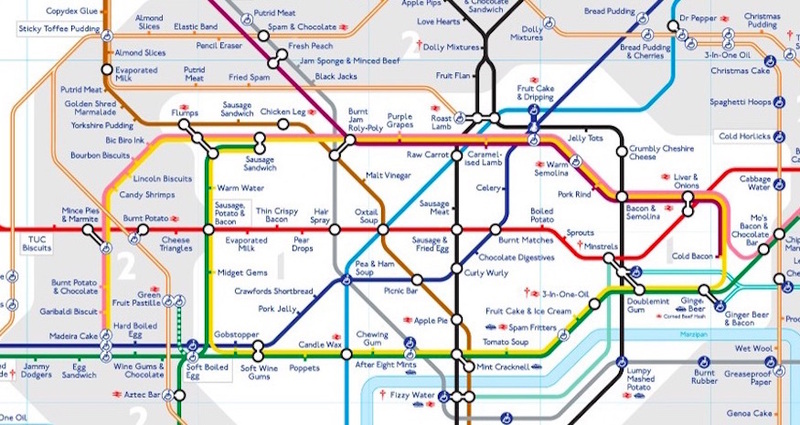 Here's another to add to the ever-growing list of alternative tube maps: one arranged by lexical-gustatory synaesthesia. James Wannerton, President of the UK Synaesthesia Association, has visited every tube, DLR and Overground stop on the network and described what the station name tastes like to him. 'Quay' seems to be currants (Heron Quays is eccles cakes and South Quay is Garibaldi biscuits), Ruislip is cherries and 'west' is chocolate. Sorry Kilburn, you are putrid meat. It's not all food either. Royal Oak is Bic biro ink, Elephant & Castle is wet sand and Brent Cross is Corgi car tyres. We're also quite tickled by Hampstead: start singing the Monty Python spam song, for that is what you are. The Telegraph has the full map. Apart from anything else, it's fascinating to get an insight into how someone else perceives the world.